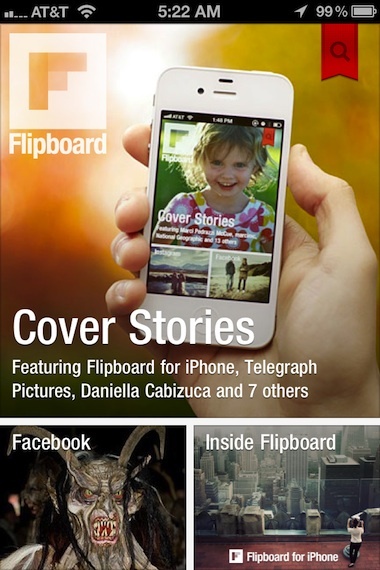 Flipboard is the news reader that introduced a flip in app navigation thinking. Introduced for the iPad, it offers the ability to add news providers that you see as squares of the top story image for each feed. To continue the magazine feel, you choose a feed’s square and then flip through the news stories. All very graphic and natural. (A previous time we covered Flipboard: Flipping through the news on the iPad got an update). Today, when you install the update of Flipboard, you are given the option to create a Flipboard account. 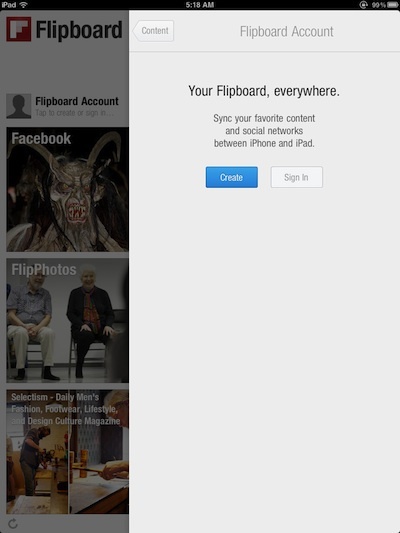 The reason you will want to do this is because Flipboard has gone ‘Universal’… it works on the iPad and iPhone. By having an account, the chosen news feeds and groupings will flow between the two devices. You will need to install Flipboard onto your iPhone, upon launching your given the option to put in a user name/password to sync between your iPad and iPhone. As soon as that is done, you launch right into the starting screen of Flipboard. For those of you that sync your iPad and iPhone to the same computer and have it set to sync updates overnight, you may have Flipboard on your iPhone when you get up. We have found many times when an app goes Universal, it auto installs on the other devices on the same iTunes account. 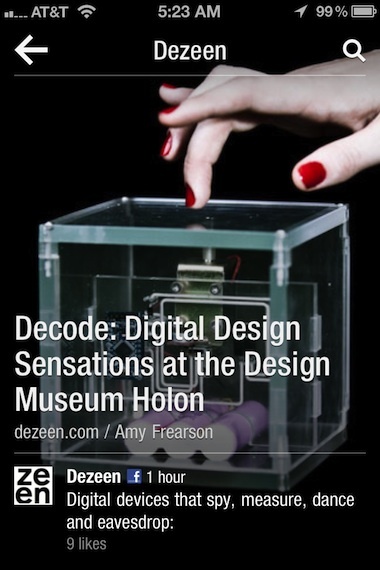 The squares of feed images overview page of Flipboard looks very familiar on the iPhone as you know from the iPad. The red ribbon in the upper right corner comes in from the top instead of from the right, that’s a visual thing only. Selecting it still takes you to the place to see, edit, add, remove news feeds. If you have more than one page of feeds, on the iPhone you flip up and down to cycle through the news provider squares. 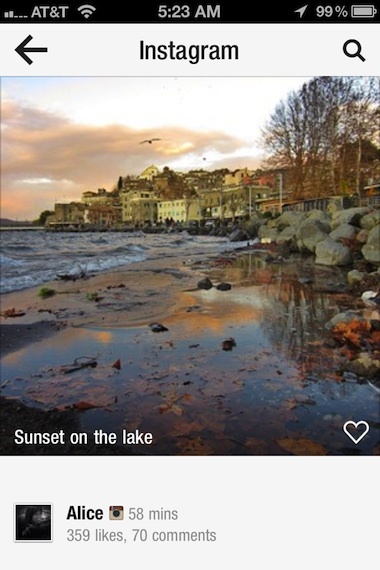 Selecting one of the news feed provider’s square takes you to the first image/story they have provided. The upper left arrow takes you back to the overview page of Flipboard. Turning the page to the next story in the feed your viewing is a flip up/down while the iPad version has always been left/right. Tapping the lower part of the story brings up the link to the full story and the share options that normally show all the time on the larger screen of the iPad. 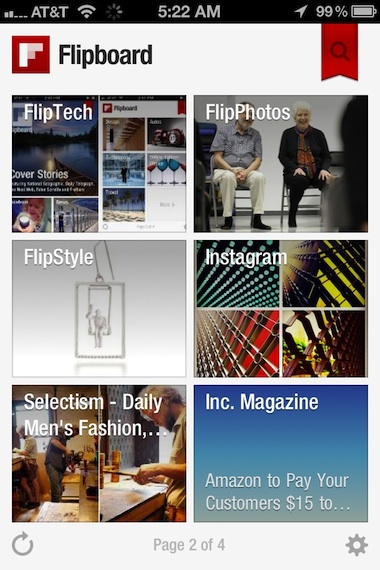 Flipboard lets you have feeds from social sites too like Facebook and Instagram. 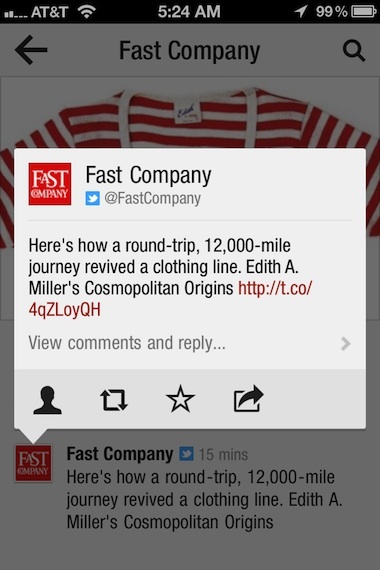 A new feature for the Instagram feed view is the little heart that allows you to ‘like’ a photo from within Flipboard. It used to be a view only solution.